Launched on January 5 in London, the latest round of Men's Fashion Weeks ended on Sunday, January 20, in Paris, with much-anticipated shows by Jacquemus and Celine. On the runways for the 2019-2020 fall-winter season, suits in a wide range of styles made a major comeback. Here's a look back at three of the main trends that went on show on the catwalks of London, Milan, and Paris. Perfectly cut, reworked in sportswear or streetwear looks, or completely deconstructed, suits were a mainstay of several runway shows in London, Milan and Paris. 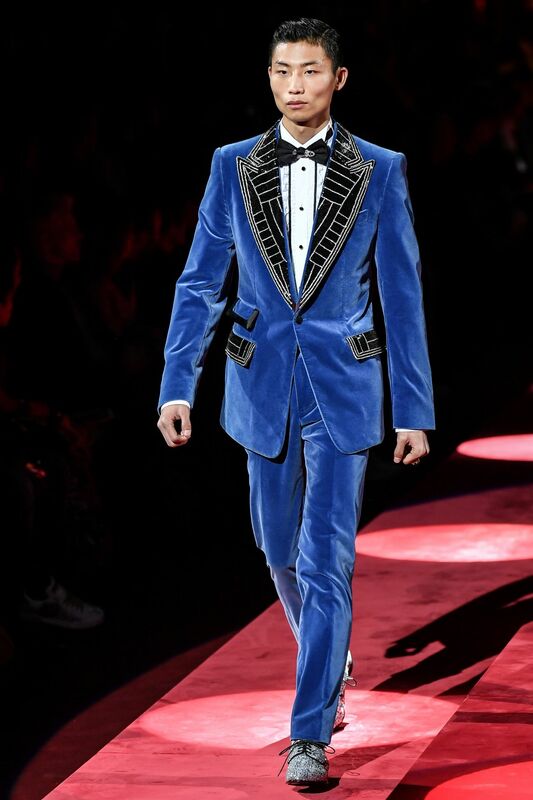 Those in the French capital notably paid homage to the art of tailoring with numerous models for the modern urban man. Hermès, Dolce & Gabbana, Berluti, and Dior Homme placed a particular emphasis on suits for the season, Louis Vuitton reinterpreted them in a streetwear spirit, and Thom Browne deconstructed them to create pieces inspired by women's fashions, but menswear they remained. The trend for wrapping up in a wandering vestimentary cocoon is no longer confined to womenswear. For the 2019-2020 fall-winter season, designers have chosen to bundle up the modern man in warm, wide-cut pieces offering ample protection from the cold. Along with leather jackets and long overcoats, streetwear-inspired oversized quilted coats were on view in several shows. Off-White, Ermenegildo Zegna, and Louis Vuitton figured large among the proponents of this new type of new type of anorak, while Dries Van Noten presented shorter puffer jackets that wrap around the male figure. Some fashion houses -- notably menswear label Sunnei -- also unveiled ultra-long scarves in a further iteration of the cocooning spirit. With a welter of cheetah, panther, leopard, and snakeskin looks, animal prints ruled the roost in the 2019-2020 fall-winter season shows in London, Milan and Paris. Several fashion houses, notably Celine, made use of animal-print motifs to add a wild touch to their suits and overcoats, while others, like Versace and Marni, mixed animal prints and flashy colors. Animal-skin prints, albeit ultra-sober ones, were also a feature of the Dior show.